You’ve probably noticed via Instagram stories that I’ve been on a bread baking kick lately. The inclination to bake my own sandwich bread came after visiting my Grandma and watching her crank out her homemade bread quicker than Martha Stewart. Not only was the bread SO much better than the store-bought version, but it was a creative hands-on activity that I felt I could incorporate into an afternoon. Plus, baking homemade bread just makes me proud, you know? So here we are! 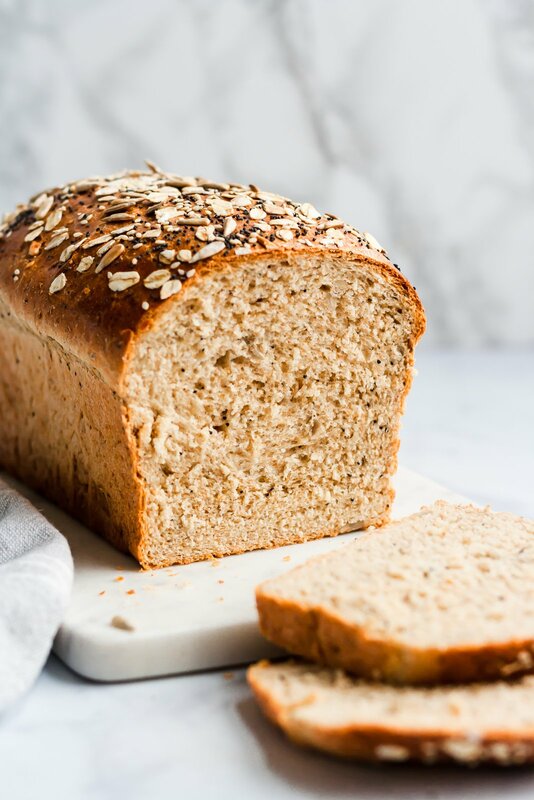 The recipe you’ve been waiting for: my soft, homemade healthy sandwich bread recipe made with whole wheat flour, nutritious seeds, oats and naturally sweetened with just a touch of honey. I’ve been making this for over a month and can’t stop. Each week a new batch bakes in my oven, making the house smell wonderful. 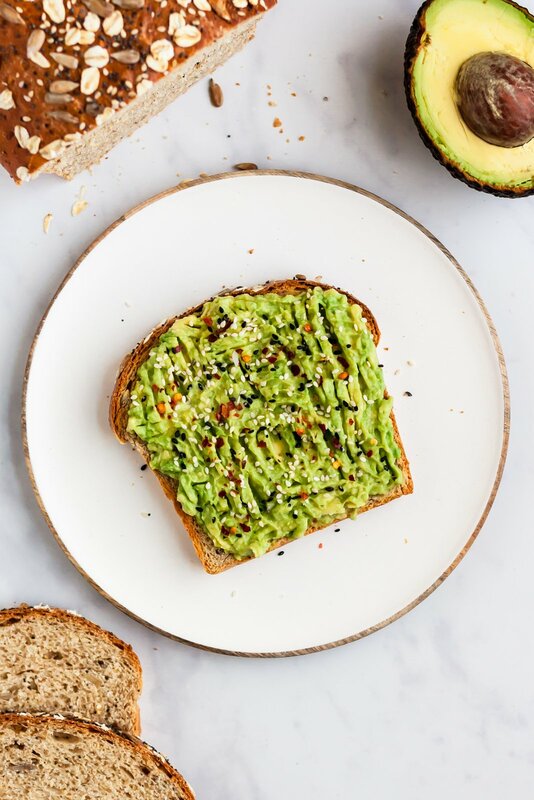 We use this sandwich bread recipe for sandwiches, garlic bread, french toast, avocado toast — the list goes on! And now you can make it too. Milk: I’ve used both regular milk and almond milk with success. You just need to make sure the milk is warm, but not hot. 115 degrees F is the optimal temperature for bread making, but if you don’t have a thermometer to use, the best gauge is your finger. Warm the milk feels like warm bath water when you test it with your finger. 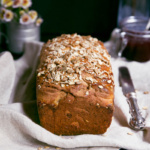 Oats: this healthy sandwich bread recipe calls for whole grain rolled oats. It adds a nice hearty texture to the bread. The oats will soak in the milk for 5 minutes to help soften them a bit. Honey: to help activate the yeast, we’re using a tablespoon of honey which gives the bread a very slight sweetness. If you don’t want to use honey, brown sugar will also work. Yeast: use quick rise or instant yeast in this sandwich bread recipe to help the bread rise faster. You can also use active dry yeast, but the bread may take a slightly longer time to rise. Butter: fat helps to give the bread a finer crumb and better texture, but we’re only using 3 tablespoons. Feel free to use vegan butter too! Bread flour: to help keep this seedy sandwich bread soft, fluffy and airy, we’re using bread flour, which has a higher protein level to help lighten the bread’s texture. The higher amounts of protein help to produce more gluten, which give bread it’s chewiness, texture and traditional airy holes. 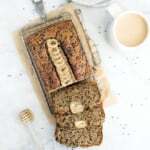 Whole wheat flour: I wanted this sandwich bread recipe to include whole grains so I opted for a little whole wheat flour. 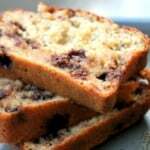 It’s important that you use 100% whole wheat flour in this recipe. 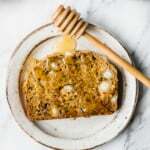 Flaxseed meal: not only does flaxseed meal help to absorb some liquid in this recipe, but it also adds a healthy dose of fiber and protein to the bread. Flaxseed meal is critical, please do not skip it. 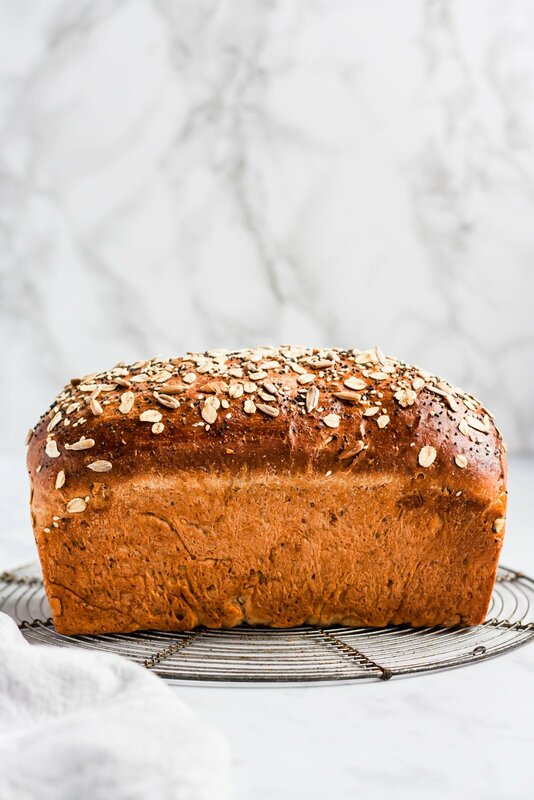 Seeds: this recipe calls for sunflower seeds, sesame seeds and poppyseeds, which not only enhance the flavor of the bread, but also give it a delectable slight crunch especially when toasted! Salt: bread made without salt tastes very plain and in addition, salt also helps to control yeast in bread recipes so don’t skip it. Technically you should use a scale to measure flour, but there’s really no problem if you don’t have one because most yeast breads can be very forgiving. Learning how to measure flour properly will ensure success. Dip a flour scoop or large spoon into the container of flour and scoop the flour into your dry measuring cup. Do not pack the flour or shake the measuring cup so that the flour settles. We want some air in the flour (it’s nature’s leavener). Once you have filled the measuring cup to the top with the flour you’ve spooned in, take the edge of the four scoop of the flat edge of a knife and level the cup. That’s it! 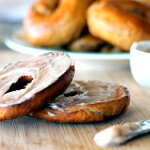 I get this question all the time in my cinnamon roll recipe and can understand why it may be confusing to know if your yeast is activated. First it’s important to know that there are two types of yeast to choose from. The first is an active dry yeast, which must be dissolved in liquid, or also what’s known as being “proofed” before it’s added to the rest of the dough ingredients. The second type of yeast is instant yeast, also known as quick rise yeast (this is the brand I use and love!). 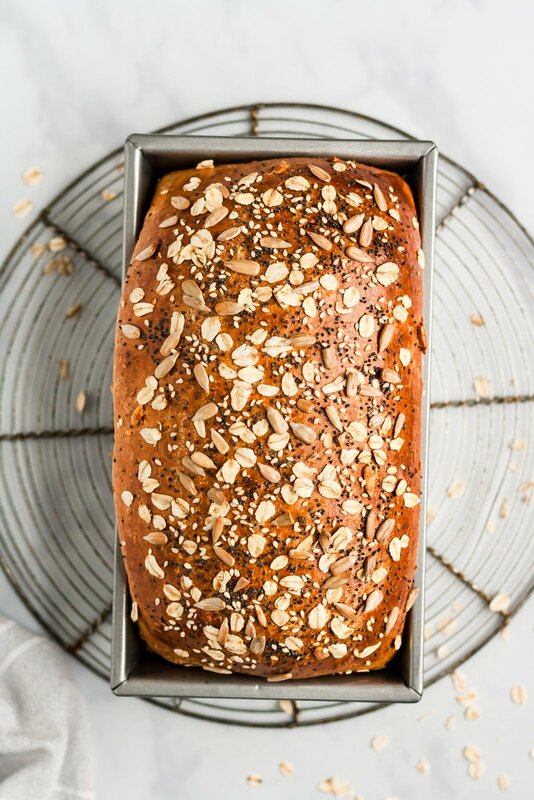 That’s what we are using for this seedy healthy sandwich bread recipe. It can be added to the dough without proofing required. However, I still like to dissolve it in a little bit of milk to help get it started. You can use either type of yeast in this recipe, just know that you if you active dry yeast, it may take the bread longer to rise. You’ll know when the yeast is activated when you see a few small foamy looking bubbles start to pop up in the milk/oat/honey mixture. The bread should not come more than 1 inch above the brim of the pan during the second rise. The weather, how much you kneaded the dough and temperature in your home can affect how quickly your dough will rise. So just make sure you’re keeping a close eye on it. Bread is done when the internal temperature reaches 190 degrees F. This bread is always perfectly done from me between 35-40 minutes. Wait at least 2 hours until cutting into the bread. I know it can be very tempting, but if you cut into it sooner it will most likely alter and change the texture. 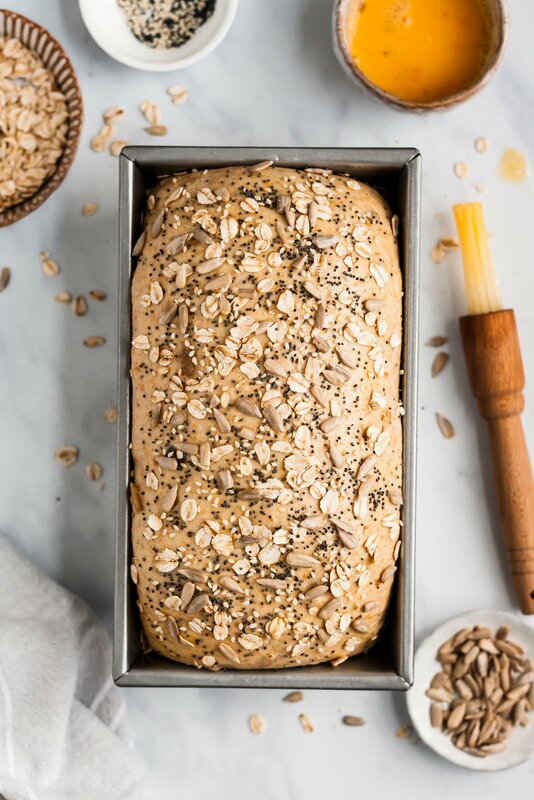 This bread can easily be made vegan, simply use brown sugar instead of honey, almond milk for the regular milk, vegan butter and skip the egg wash! It’s best to store homemade sandwich bread on the counter. Once bread is completely cool, wrap in plastic and store at room temperature. If the weather is hot or humid, it’s best to store the bread in the refrigerator. To freeze the bread: wrap in plastic wrap, then seal it in a ziplock plastic bag, making sure to get all the air out of the bag. You can also wrap the bread in plastic and then wrap it tightly in foil. Bread should last 3 months in the freezer. Once ready to serve, unwrap the bread and thaw at room temperature. I hope you LOVE this bread as much as we have enjoyed making it for you! 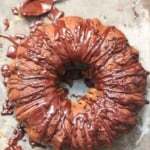 PLEASE leave a comment and rate the recipe if you make it! ENJOY! xo. Heat milk in a small saucepan over low heat until milk is warm (about 115 degrees F). It should be warm to the touch like warm bathwater but not hot. Remove from heat and pour into a large bowl and stir in oats, yeast and honey. Let the mixture sit for 5 minutes. Next, stir in melted butter into the bowl with the oats/yeast/honey. Immediately add in bread flour, whole wheat flour, flaxseed meal and salt mix with a wooden spoon until a dough begins to form. Add in sunflower seeds, sesame seeds and poppyseeds and gently mix into the dough. At this point I like to get the dough to come together with clean hands. Place dough onto a well-floured surface and knead the dough with your hands for 10 minutes. Another option is to use the dough hook on your electric mixer to knead the dough (I prefer this method because it's easier). Once done kneading, form dough into a ball and place in a large bowl coated with about 1 tablespoon oil, turning the dough over to coat with oil. Cover with plastic wrap and a warm towel and allow the dough to rise for about 90 minutes, or until doubled in size. This may take more of less time depending on the weather or temperature in your home. Next, grease a 8x4 inch loaf pan. After dough has risen, knead it just a few more times on a clean surface coated with whole wheat flour for about 1 min then shape dough into an 8-inch long log and place in prepared pan, tucking the ends underneath. Cover the loaf with plastic wrap and a warm towel and allow it to rise again for 60-90 minutes or until the loaf has risen an inch above the brim of the pan as demonstrated in the video. This may take more or less time depending on how warm it is in your home. Watch carefully because you don't want the dough to rise too much. Once dough has risen the second time, preheat oven to 350 degrees F. Beat egg in small bowl and brush over the top of the dough. (Please note that you won't need to use all of the egg wash, but only a small amount.) Sprinkle a few more oats, sunflower seeds, sesame seeds and poppyseeds on top of the dough. Bake for 35-40 minutes or until loaf is slightly golden brown on top and the loaf sounds hollow when tapped. Transfer pan to wire rack to cool for 10 minutes, then remove bread from pan and place on wire rack to finish cooling for at least 2 hours. Do not cut the bread before it is completely cooled or the texture will change. Bread should be wrapped tightly and store at room temperature. If it's humid/hot, store bread in the fridge. Cut into slices with a serrated knife. Makes 15 slices. Bread is excellent toasted with butter, peanut butter, garlic butter or mashed avocado. It’s great for grilling or for sandwiches too! To make this bread vegan: use brown sugar instead of honey, almond milk for the regular milk, vegan butter and simply skip the egg wash! If you have any other questions, please leave them below, I’d love to hear from you! As always, I’d love if you’d leave a comment and rate the recipe once you’ve made the bread. It’s very helpful for Ambitious Kitchen and readers! 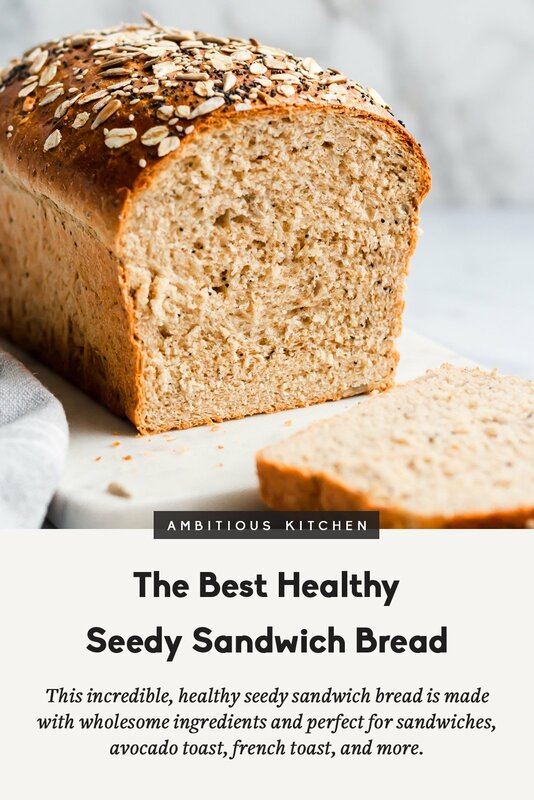 30 Responses to "Best Healthy Soft Seedy Sandwich Bread"
Can you use white whole wheat flour in this recipe with success? I would like to know the same because it is what I currently have on hand. I haven’t tried it. I’m sure it would work, you just may need to add in a tablespoon or two more flour. Never made bread before and tried this recipe with white whole wheat flour and pumpkin seeds instead of sunflower seeds because its what I had. So easy! Still need to master kneading correctly and knowing when bread is under/over prooved but youtube videos are great for that! I may never buy sandwich bread at the grocery store again! So glad you loved this one! Bread making just takes practice, but homemade is the best way to go. We haven’t tried it but I think it might work; let us know if you try it! I love to make bread and if short on time can this be made in a bread maker? Hi Pam! We haven’t tried it but I think it might work; let us know if you try it! Also wondering if it can be adapted to use my bread machine…..
Hi Debra – we haven’t tried making it in a bread machine but I think it might work; let us know if you try it and if you made any adaptations! This brad seems too good to be truth! Can this bread by made in a bread machine? It’s incredible! We haven’t tried it in a bread machine but I think it might work; let us know if you try it! I made this today! Turned out great. We loved it for our sandwiches. Question – do you think I could double the recipe easily? I feel like my kitcehnaid could handle it. We would eat 2 loaves a week in our fam. At least! Thanks for the recipe. Yes, absolutely! You could also knead half by hand and half with your kitchenaid. 🙂 See which one comes out better?! 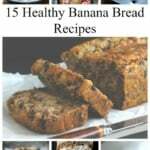 Can this be made with coconut flour or almond flour? I made this twice in the last 24 hours. My first try, i’ll be honest, didn’t turn out. I forgot the butter, and I over kneaded it. It turned out pretty dense, and it didn’t rise as much as it should have. But I’ve tried so many of your recipes before, and have never had one not turn out, so I knew it was me, and not the recipe. So I tried it again, following the directions more closely, and it turned out beautifully! I can’t wait to use it all week to make sandwiches for work. Thanks for the great recipe! Hi Emily! Thanks so much for your comment. Bread can definitely be tricky (it’s way more scientific than other baked goods!) I’m glad you gave this one a second shot and that it turned out amazing 🙂 Enjoy! Hi! Sharing my experience in case it helps anyone else out: used Califia farms unsweetened almond milk and regular active yeast (not quick rise). Didn’t add poppy seeds cause I didn’t have any. Measured out flour with a scale. Came out perfect! My first loaf EVA! Perfect! Thanks for sharing those details. Glad you loved this one!! 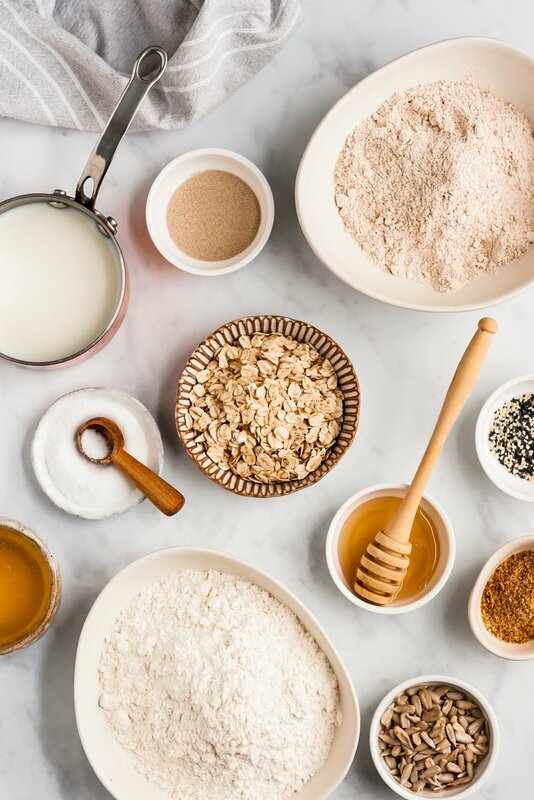 Can I know which brand of bread Flour and whole wheat flour do you use ? I want to l so it’s ok to use stone ground whole wheat flour ? Just made this in my bread machine, following directions to a “T”, turned out marvelous.